Home » Blog » Uncategorized » Is your window Air Conditioner going to keep you cool in the winter too? Is your window Air Conditioner going to keep you cool in the winter too? Wow! The leaves have changed color, winter is almost here. You are not going to need your air conditioner until next summer. Make sure you take the right steps to winterize – don’t just shut off your AC and forget about it until next summer. 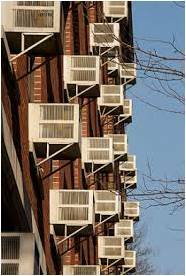 The highest concentration of room air conditioners is in the northeast, where cold winter conditions make ”just” leaving it in the window impractical, since winter weather can affect both the units and the home. Winterizing air conditioners is one way to increase their durability and extend their life. So what do you do with it for the winter? The best solution is to take the air conditioner out of the window, clean it, and store it somewhere for the winter. In cities like New York and Boston storage areas are harder to come by, so many are left in the window for the cold months. If storage isn’t an option there are several strategies for winterizing your AC that will reduce heat energy loss and extend the life of your air conditioner: (1) Put a cover over the AC unit; (2) Make sure all gaps and holes are sealed; (3) Replace typical accordion style side panels which are very thin and have minimal insulation with closed cell foam panels. This helps to keep the window air conditioner dry and insulated during months of heavy rain and snow. There are many reasons to give your air conditioner a little TLC during its winter rest. Covering and cleaning your air conditioner will extend its life and reduce maintenance expenses. In a survey conducted for Urban Green Council, There Are Holes In Our Walls found that the average room air conditioner leaks as much air as a six square inch hole—and increases total annual heating costs by $130-$180 million in New York City alone. Sealing and insulating around your unit to eliminate air leaks will save you money by reducing your electric bill. Insulating and sealing will also increase your comfort eliminating winter cold spots around your air conditioner. The best part insulation will also keep your cool air inside where it belongs in the summer.